Triona gasped as Ronan was beside the bed in two strides. Suddenly she was wrenched from beneath the covers to her knees, Ronan’s fingers biting cruelly into her arms. Her outburst hung in the air as the room fell silent, Ronan’s eyes narrowing in disbelief. The huskiness of his voice sent shivers spiraling from her stomach to her toes. 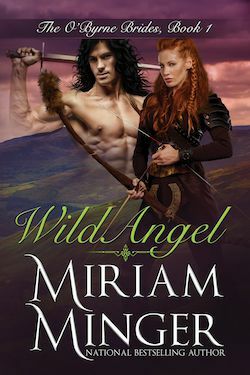 Suddenly acutely aware of how closely he held her, his silvery eyes blazing into hers, Triona found she had only a bare whisper of voice to answer. His lips came down upon hers before she could pull away, Ronan’s arms enveloping her so tightly that she feared for a fleeting moment she might be crushed. But her fear disappeared when his mouth began moving over hers, slowly at first as if sampling the taste of her, savoring the warmth of her, the feel of her…then more hungrily as if he liked very much what he’d found and meant to devour her. And she was certain she was being devoured when his tongue suddenly swept deep into her mouth, one hand plunging through her hair to tilt back her head while the other drew her that much closer…so close she could feel his heartbeat thundering against her breast. Or was it hers to match the blood pounding in her ears? Within an instant, the sound had grown to a deafening roar, her fingers clutching wildly at his tunic as a raging heat suddenly engulfed her from head to toe. Yet no sooner had her tongue begun to spar with his in a thrilling dance that sent her senses spinning and her insides melting then she heard him groan, his body tensing. Triona’s eyes shot open as Ronan lifted his head away from hers though he still held her tightly around the waist…as if reluctant to let her go. But when he spoke again his voice was no longer husky. She slapped him across the face almost before she was aware she’d raised her hand. Her body trembled in outrage and chagrin that she could have so wantonly lost all control of herself. He dodged to the side before her doubled fist could slam into his stomach, catching her as she almost toppled forward from the bed. In the next moment, her arms were pinned painfully behind her back, his face only inches from her own. Ronan released her so suddenly that she fell back onto the mattress, almost landing on Maeve who screeched and jumped to the floor. Conn had long since risen to his feet, his big brown eyes looking uncertainly from Ronan to Triona as he began to whine. He ducked out, slamming the door behind him just as a pillow came hurtling through the air.